This Atlanta log cabin is a fantastic multi-functional outdoor space for any garden. 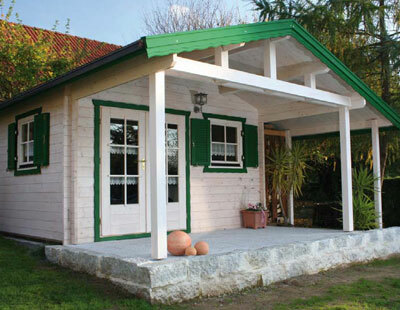 Constructed from strong 45mm (1.8") logs this cabin is designed to last for many years. The cabin includes a front veranda as well as a lean to canopy to the side. These features offer shelter from the weather and also an ideal solution for protecting garden tools, bikes etc. The cabin includes a set of attractive double doors which are 3/4 double glazed with Georgian bars. The cabin also has two turn cant windows with elegant shutters. Comes untreated. This log cabin is built to order and so includes many variable options for example; extension of any size, porch, canopy, brass Georgian bars between window panes, flower boxes, roof shingles and paint. Double door with 3/4 Georgian glass finish.